Squealing, shrieking, marvelling and applauding, is not the law however slips-out naturally when one finds themself seated in a production put on by these guys. For they are born entertainers and have all bases covered. And WOW – they really lead the pack when it comes to mastering disguise. 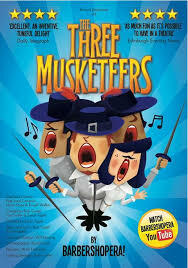 ‘Thrilling’ audiences and gathering fans since 2007, their latest production focuses on the tale of Nicole D’Artagnan as she recruits the Musketeers to help fight the jam roly-poly embargo which threatens the very livelihood of her local community and France as a whole. Don’t be alarmed… though note… the action is fast, the Cardinal’s wicked and the demands on these four are epic. Will they? Won’t they? Retrieve that King’s golden plums. Will they? Won’t they? Discover that D’Artagnan isn’t a boy. Will they? Won’t they? Manage to secure sufficient amounts of English gastronomic pleasures for King Louis’s birthday party. Yes, it is edge of the seat, suspensed-filled drama and fun – incredibly fun. From the concept itself (think Blackadder with the added bonus of song), through casting (Bucky is so very good), music and lyric composition, direction, choreography and props – it’s all there and in abundantly, perfectly, co-ordinated supply.